Attilio Pratella received his first instruction in drawing in his early years in Lugo di Romagna. Then he studied at the Accademia di Belle Arti in Bologna. In 1880 Pratella departed for Naples, where he became acquainted with the painters of the school of Resina. 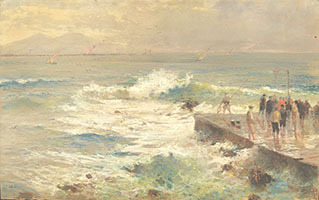 In 1886 his painting The Morning was exhibited at the Società Promotrice di Belle Arti and acquired by the Galleria d'Arte of Capodimonte. Thereafter Pratella attained full success. Pratella was a sensitive draftsman, he drew during his whole creative life, incessantly studying landscape.